Enda Coughlan of Clare in action against David Moran of Kerry during their All-Ireland quarter final at Croke Park. Photograph by John Kelly. CLARE’S 2016 championship season ground to a very definite halt in Croke Park on Sunday afternoon, with Kerry advancing to an All-Ireland semi-final meeting with either Dublin or Donegal. Kerry’s eleven point win was their 14th All-Ireland quarter-final win in 16 games and their ninth successive championship win over Clare since 1992. Clare did not lack for effort but there was a clear gap in quality between the teams. Clare lacked the zip and support play evident in their wins over Laois, Sligo and Roscommon while poor decision making on the ball cost them regularly against Kerry. The attendance was 29,251. Clare had been going reasonably well until they conceded a very soft goal to Donnchadh Walsh in the 20th minute of the opening half. 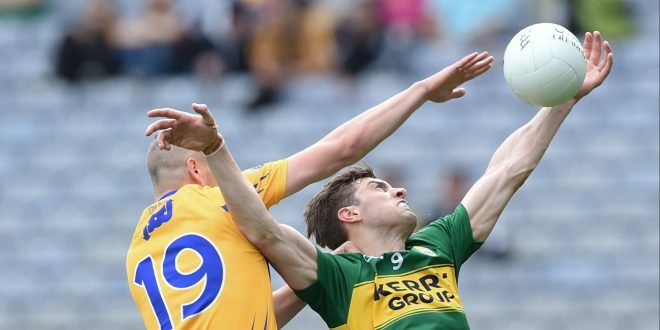 Kerry intercepted a Martin McMahon pass and although Dean Ryan tried valiantly to somehow direct the ball away from goal, it broke for Walsh who could not miss from close range. That was the crucial score of the opening half and opened up a 1-6 to 0-3 lead for Kerry. Clare had settled reasonably well and two David Tubridy points, from a 45 and a free, added to an Eoin Cleary free had tied the game 0-3 each after 16 minutes. Tubridy’s pointed free was for a foul on Cleary, who for a fleeting moment was almost in on goal. Cleary’s pointed free followed a foul on Cathal O’Connor who started on Kieran Donaghy, until Kerry moved the Austin Stacks midfielder on to Gary Brennan. A minute before half-time, Cooraclare’s Pearse Lillis put over Clare’s only score of the opening half from play. They were 1-8 to 0-5 down at half time and while Jamie Malone pointed from play in the second minute of the new half, Clare never threatened to turn the game into a contest. Any chance that they might have clawed their way back into it evaporated five minutes into the second half, when Darran O’Sullivan sped away from Gordon Kelly and buried Kerry’s second goal. He was set up by excellent full forward play from Paul Geaney. That put the winners into a 2-8 to 0-6 lead and that was that. Eoin Cleary from three frees, David Tubridy from another dead ball and substitute Pat Burke kicked Clare’s remaining second half scores. Kerry full forward Paul Geaney kicked two early points for his side, James O’Donoghue added three points, two from play. Darran O’Sullivan pointed twice while Donnchadh Walsh’s 32nd minute point completed Kerry’s first half tally. Clare looked tentative for much of the opening half and their support game was not sufficiently energetic to trouble Kerry. Kerry’s shooting was very poor at times in the second period but Barry John Keane put over three points from play, while James O’Donoghue, Bryan Sheehan, Paul Geaney and Stephen O’Brien also pointed for the Eamon Fitzmaurice managed team. What will disappoint Clare most is that they did not make a game of it. Very few players looked as sharp as they needed to be. Only Seán Collins, Dean Ryan and Jamie Malone in the second half did well for Clare. Gary Brennan was very involved in the opening half but was not as evident after that. Clare only scored four points from play and that underlines one of their issues in this game. They were unlucky not to score at least one goal and Jamie Malone hit the post 16 minutes from time. The Clare Champion will have more on this game on Thursday with post match interviews and analysis. Clare: Joe Hayes (Lissycasey); Martin McMahon (Kilmurry Ibrickane), Kevin Harnett (Meelick), Shane Hickey (Kilmurry Ibrickane); Cian O’Dea (Kilfenora), Gordon Kelly (St Joseph’s, Miltown), Dean Ryan (Éire Óg); Gary Brennan (Clondegad-captain), Cathal O’Connor (Coolmeen); Seán Collins (Cratloe), Podge Collins (Cratloe), Jamie Malone (Corofin), Eoin Cleary (Miltown); Pearse Lillis (Cooraclare); David Tubridy (Doonbeg). Subs: Keelan Sexton (Kilmurry Ibrickane) for Cian O’Dea (half-time), Shane McGrath (Thomas Davis) for David Tubridy (47), Enda Coughlan (Kilmurry Ibrickane) for Cathal O’Connor (49), Pat Burke (Kilmacud Crokes) for Shane Hickey (57), Seanie Malone (Miltown) for Gordon Kelly (64). Scorers: Eoin Cleary (0-5f), David Tubridy (0-3, 1f, 1 45), Pearse Lillis, Jamie Malone, Pat Burke (0-1 each). Yellow cards: Gordon Kelly, Cian O’Dea, Shane Hickey, Keelan Sexton and Kevin Harnett. 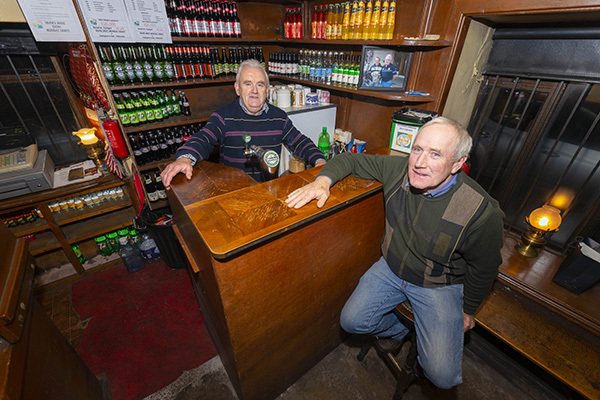 Kerry: Brian Kelly; Shane Enright, Mark Griffin, Killian Young (captain); Brian O’Beaglaoich; Peter Crowley, Tadhg Morley; Kieran Donagh, David Moran; Stephen O’Brien, Donnchadh Walsh, Paul Murphy; Darran O’Sullivan, Paul Geaney, James O’Donoghue. Subs: Aidan O’Mahony for Tadhg Morey (44 BC), Barry John Keane for Donnchadh Walsh (44), Anthony Maher for Kieran Donaghy (47), Bryan Sheehan for David Moran (52), Marc O’Sé for Peter Crowley (52), Tony Brosnan for James O’Donoghue (66). Scorers: Darran O’Sullivan (1-2) James O’Donoghue (0-5, 3f), Donnchadh Walsh (1-1), Paul Geaney (0-3, 1f) Barry John Keane (0-3), Bryan Sheehan (f) and Stephen O’Brien (0-1 each). Yellow card: Darran O’Sullivan, Stephen O’Brien and Barry John Keane. Black card: Tadhg Morley. Wides 14 Frees: 16 Referee: Maurice Deegan (Laois).